From the Korean president to Hollywood celebrities, many have enjoyed authentic Hanjeonsik (Korean traditional course meal) at our restaurant. We have one main dining hall and ten private rooms that can accommodate 2-40 guests at no additional charge. We offer large banquet halls to host your special events, including business meetings, wedding rehearsals, receptions, and birthday parties. "Yongsusan" means "dragon water mountain," the name of a mountain in Kaesung, capital of the ancient Koryo Dynasty. Our Master Chef and founder Sang Oak Choi was born and raised in Kaesung and mastered both the Kaesung and Royal Court style of cooking. Yongsusan specializes in Kaesung and Royal Court cuisine, which is now special and difficult to come by even in Korea. 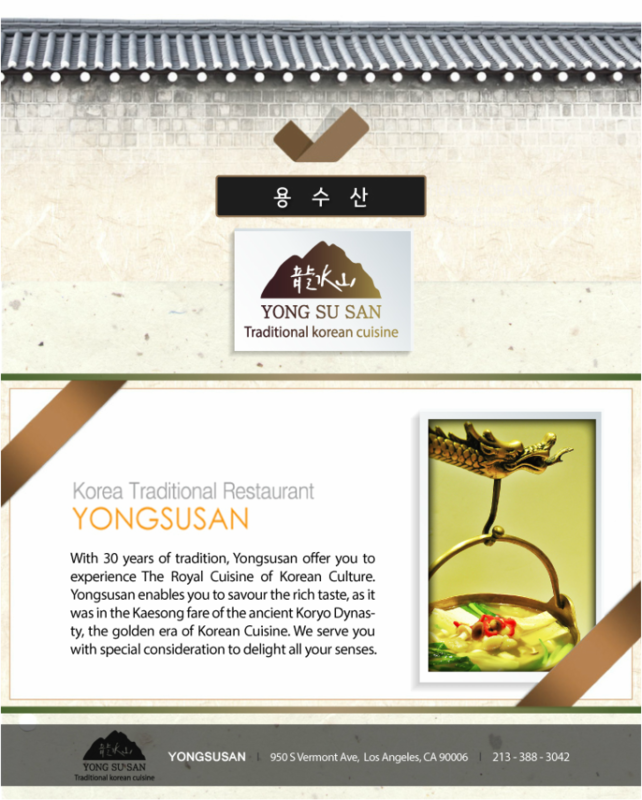 For a great dining experience, come visit us at Yongsusan of Los Angeles. Provided catering for the annual Korea Times Korean Music Festival at the Hollywood Bowl. Provided catering for K-pop music artists performing at the Nokia Theatre and Staples Center. Recognized by the Michelin Guide as the Best Korean Restaurant in Greater Los Angeles. Served as the Los Angeles host restaurant for the worldwide Cultural Development project for Korean restaurants sponsored by the Korea Ministry of Culture, Sports and Tourism. Participated in Korea Food Beyond BBQ food tasting press event and demonstrated kimchi salad making. Contributed to the PGA Humana Challenge Korean Food Tasting event held for PGA players and the press.